1. Powerpoint presentation on grafting and budding; step by step instructions. 2. A live demonstration of several types of grafts. 3. A bare-rooted or potted citrus rootstock to graft, and take home (extras citrus rootstock are $7. each). 4. All supplies necessary to graft. 5. A handout of class notes. You can cancel at anytime up until the time the class starts. If you have signed up and know that for some reason you can't come, please inform me so that someone else can take your place in that class. You do not have to pay in advance. Pay when you show up for the class. A $5.00 discount will be given to a second family member who signs up. I will have extra grafting supplies to purchase. 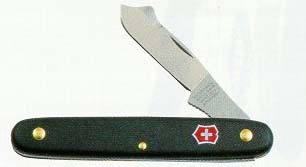 Imported Swiss stainless steel grafting knife with finger guard. Note the manufacture has changed the handle color to red.